OK … confession time. I am not snowed in. I actually enjoy running in cold weather, and it was above freezing with no snow on the ground when I did this workout. I’m comfortable with running in the dark in the mornings when I travel, but something about running in the dark at night when I don’t know the city kind of scares me. So, last night, I was relegated to the treadmill, and did this fun workout. 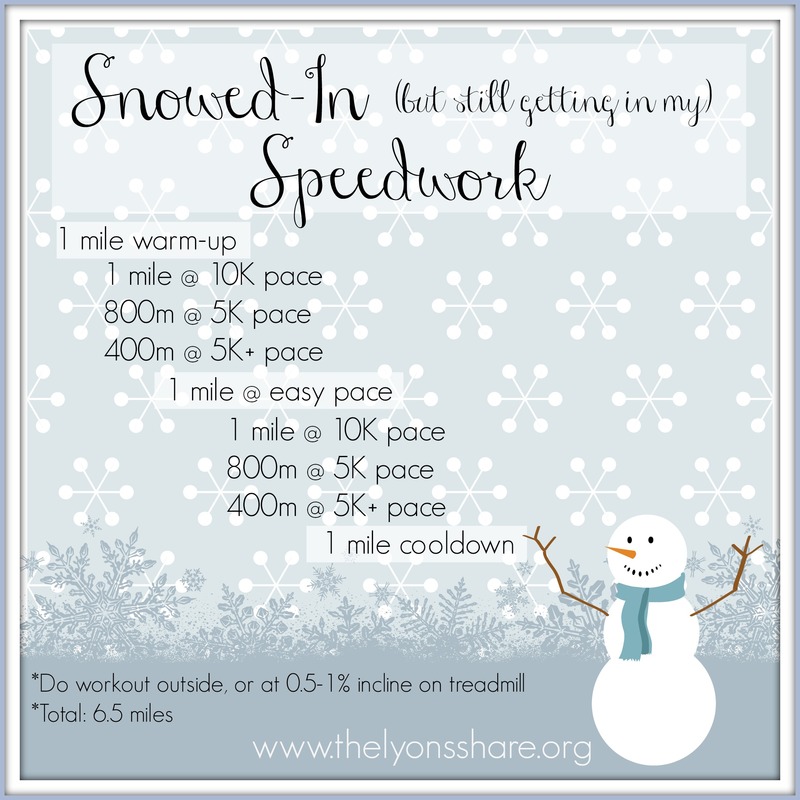 Then, I went to put it into a graphic for you on Picmonkey … and I just couldn’t turn down the fun snowflake print and adorable little snowman (he’s cheering for you to finish the workout!). SO … the “Snowed-In (but still getting in my) Speedwork” workout was born! I hear the East Coast is about to get a big storm, so maybe this will come just in time for some of you anyway. Enjoy! If you don’t know your 10K and 5K times, just pick a speed that feels sustainable, but not comfortable, for your 10K pace, and pick a pace that feels quite hard for your 5K pace. Then, for the 5K+ pace, bump it up by 10-15 seconds per mile … you should be struggling on these! I talked about the benefits of speedwork in this post, and I do believe that it’s one of the best ways to improve your race times. Mentally, I love plugging away at an easy pace for most of my runs, but teaching your body what it feels like to be really challenged is important, too! I hope you enjoy this workout! 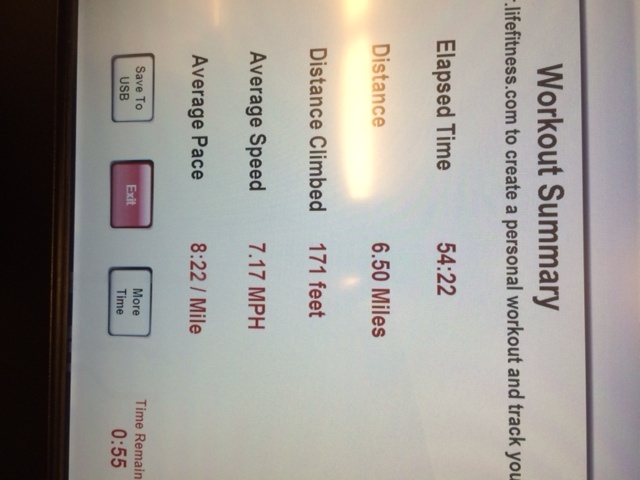 If you’re curious about my workout … I chose 6.5mph (9:13 pace) for my warm up, and cool down paces. I used 8.0mph (7:30 pace) for my 10K pace, and 8.5mph (7:03 pace) for my 5K pace. I bumped it to 8.7mph (6:53 pace) for the 5K+ pace. For my mile easy in between sets, I walked for 0.1 miles (avoid this if you can, but I needed it! ), and then ran at my warm up/ cool down pace. This gave me 6.5 miles in about 54 minutes. I always run at 0.5-1% incline on the treadmill to mimic outdoor conditions, and last night I chose 0.5%. PS – Is it sad that I can’t wait for the holiday break from work, in part because I can catch up on all of the wonderful blog posts that have gone unread in my Feedly? Well, it’s true!!! So tell me in the comments … Have you had snow yet this year? What’s one (unconventional) reason you’re looking forward to the holiday break (if you get one, which I hope you do!)? Snow? Oh yessss in fact we got over a foot in less than 24 hours with more to come today! I’m done with it! Great workout! Hopefully I can try it out one of these days 🙂 Hope work calms down for you soon! With your amazing running build up, you’ll be trying this in no time!!! I’m totally going to try this work out in another two weeks when i start my speed work up again. This doesn’t seem as terrifying as track repeats but still looks completely effective! It snowed last week and only stayed 1 day 🙁 BUT it’s still been cold, and like you said if the ground is clear i’m running outside! It’s been almost two weeks (eek! ), so I hope you’re gearing up to try this soon!!! Haha Yep! Starting later this week i’ll have my first speed sesh! 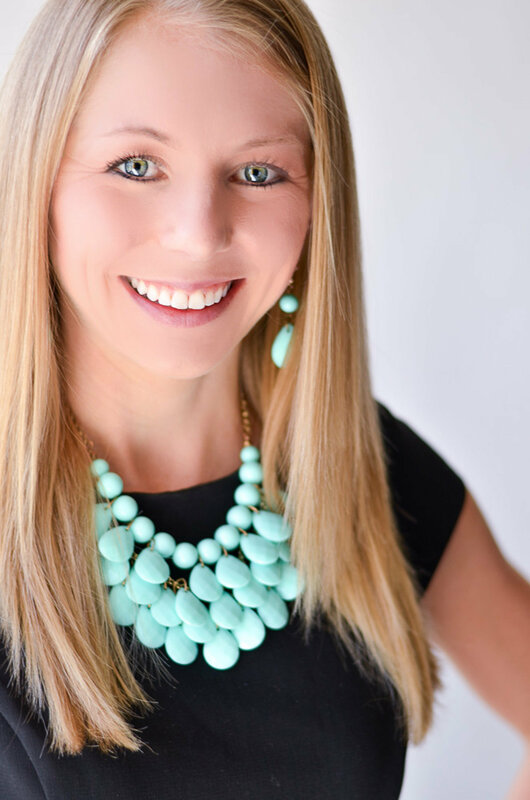 Cori @ she’s going the distance recently posted…My New Favorite Non-Running Sports Bra. We have gotten snow and it is has been consistently cold and snowy for weeks at this point. However, due to our location in west central NY, we are buffeted by the Finger Lakes and mountains and get some of the lowest snowfall amounts in the entire region (ice is another matter). So we’ve only seen ~6″ so far and have a few inches on the ground now. Quite a change from when we lived in Mass on the NH border and got at least one 3’+ storm each of the 15 years we were in that house! As for unconventional, my younger son and I made a pact based on things we wanted to do – he wants to keep up his classical piano playing chops now that he has stopped taking lessons, and I want to recommit to my guitar playing and music composing hobby. So over break he is learning a complex piece of music on piano (as opposed to noodling in the digital studio in the basement), and I am playing guitar daily and composing a new piece of music (as opposed to wasting time on the internet). Other than that I just want to maximize time with my family! Michael Anderson recently posted…Christmas Baking Day 2013! You just updated me on the weather, so I won’t even ask! I love the pact you made with your son. When you compose your new piece of music, will you share it with us? Let’s not discuss the snow here. If I had it my way I would not leave the house for the next 5 months! It is a little sad, but I TOTALLY relate! The past 2-3 weeks have been good for me, because I ended up getting so behind on blog reading and feeling so guilty about it … and then Christmas break came and I just kind of let it go! I will definitely still catch up, but at least I was able to break away without feeling guilty, despite the major Feedly backup! I love that this speed work is based on miles and not minute intervals. Can’t wait to give it a try! Thanks again for sharing this workout, Jillienne! I tried this today and loved it! It was the perfect amount of mileage to push myself in a speed workout but not overdo it. Thank you for that! Sara, I’m so glad you tried this workout and liked it! Thanks so much for letting me know! We’ve gotten snow here, but not enough that I deserve to be bitter about it yet! Quite excited about going down south to escape that for Christmas though. I’m leaving tomorrow and still have a million things to do, but oh well. Still excited. I hope you get some time off too girl! Amy, the time off has been SO amazing and restorative, and I hope the same for you! Best reasoning ever- haha, ahh picmonkey. Off topic, but did you know for a week apparently you get to use picmonkey’s paid section? I just read it earlier on! No traffic? I honestly don’t think I’ve ever driven on Christmas Day! Although I did run on Christmas morning, and the streets were absolutely dead, so I guess you have a point!